The news is so depressing at the moment, it's making me feel so sorry for all the people who have had their lives turned upside down in the cities. I am glad that we live in a lovely rural area. Last night Mr B and I thought how lucky we are, in so many ways. So I thought I'd cheer us all up over the next few days by writing about the nice things in our lives. 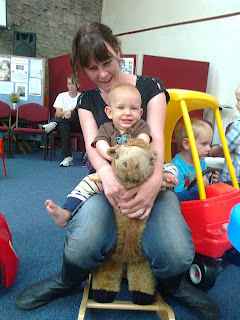 Mum and Son fun on a Camel at one of Kendals playgroups. I feel that Joel and I have really hurled ourselves into the world of mum and baby socialising, something essential for keeping your sanity! We had a slow start on this as the total shock to the system of having a baby, teamed with physical recovery and problems establishing breastfeeding meant we didn't really surface from Oakbank until some 6 weeks after he arrived. Before we knew it we had lots of places to go and friendly faces to see. Yet this wonderful world of play sessions and interaction only exist during term time, thus assuming all mums have more than one child! This leaves new mums who have built up networks of support and activity suddenly stranded. Who would have thought that when your children aren't yet at school the timetable has such a hold over what you do?